You have osteoporosis or maybe you recently experienced a fracture. Now your physician wants you to take an osteoporosis medication but you are concerned with the side effects. You know exercise plays an important role in preventing falls and improving bone health but do not know what exercises you should do and which movements you should avoid. 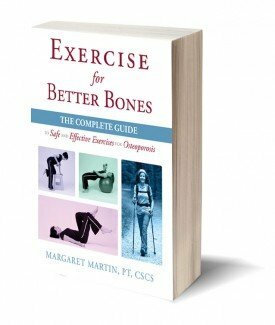 You should consider taking my free email course, Exercise Recommendations for Osteoporosis. 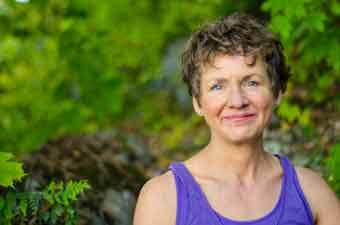 My name is Margaret Martin and I am a Physical Therapist with over 30 years of experience treating clients just like you. Take my free seven day email course, Exercise Recommendations for Osteoporosis, and learn how a safe exercise program can lead to better bones. Each day (for the next seven days) you will receive an email that includes a short video presentation on a topic related to improving the health of your bones through safe and effective exercise. To start your free course, just provide your email address below and click the Submit button. Your first lesson will appear in your email inbox tomorrow. Stop the Stoop! — Steps you can take today to avoid developing a stooped, kyphotic posture commonly experienced by individuals with osteoporosis. I call this the Stop the Stoop program. Selecting the Right Exercises and Avoiding the Wrong Ones — Not all exercises (and movements) are safe for people with osteoporosis, osteopenia or low bone density. In fact, some can actually increase your risk of fracture. I describe what exercises and movements are safe and effective for you — and what exercises are unsafe and should be avoided. Major Components of a Comprehensive Osteoporosis Exercise Program — What are the major components of a safe and effective exercise program for people with osteoporosis? I answer that question and explain why all components are important. Key Principles of a Bone Building Strength Program— You probably have been told that strength training is important for bone building — and it is. Unfortunately, I find that many of the new clients I meet have not been educated on the key foundational principles of a strength training program for bone building. I cover these for you. You will meet several people who have successfully followed the Exercise for Better Bones Program and hear what they have to say. Finally, I have consolidated all of my resources on one page, Osteoporosis Guidelines, for your reference.